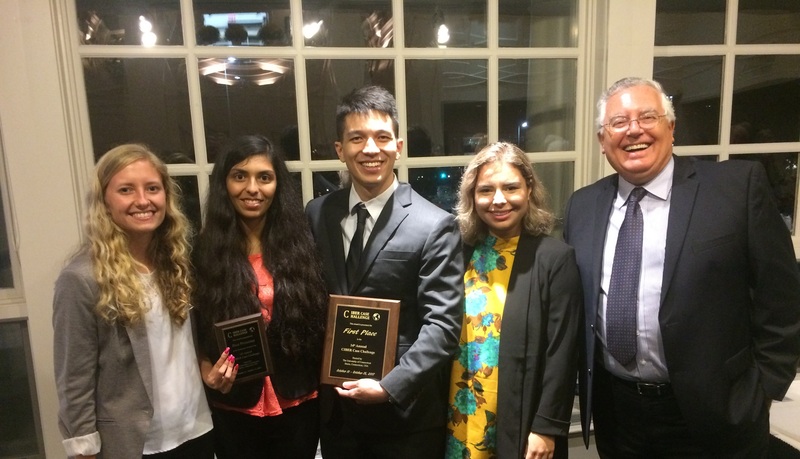 A team of Belmont University business students earned top marks at this year’s CIBER International Business case competition, held recently at the University of Connecticut in Storrs, Connecticut. Belmont’s participants included Rachel Masterson, Heta Patel, Leviere Carrillo and Joshua Dahlberg. These students competed among 10 teams made up of students from Florida State University, Purdue University, San Diego State University, Bowie State University, University of Connecticut, University of Maryland, Università di Trento (Italy), Bryant University and University of Vermont. This year’s case, “Goonj: Essence of Sustainability and Scalability of a Social Venture,” challenged the students to create a sustainable strategy for Goonj. Dahlberg’s team won its preliminary round and advanced into the final round. Additionally, Patel won an individual award for best presenter in her preliminary round. After the final round and judging, Dahlberg’s team placed first overall in this year’s competition.